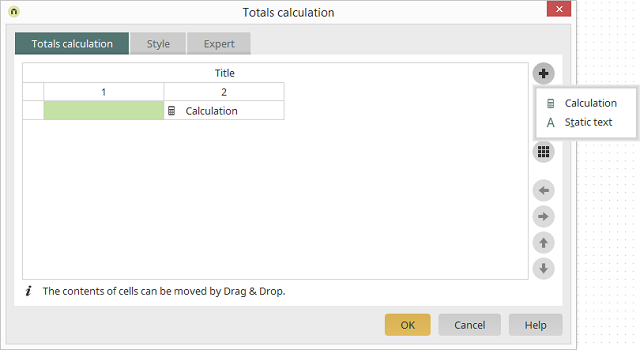 In this dialog, the cells of the total calculation of a table can be configured. Only the columns that are visible in the table (i.e. that are not hidden) can be used in the calculation. Under each column name, you will see a corresponding number. This number represents the index used in the calculation for a table column. Please note that for actions such as adding, moving, or deleting table columns, that only the index of the visible columns is adjusted in the area of the total amount. The contents of a column are not automatically moved, but they may be deleted, depending on the action. Adjustments to the content must be performed by the users themselves. Columns are always added or deleted at the end of the total amount area. Opens a menu where you can select whether you would like to add a "Static text" or a "Calculation". The currently selected control is removed. Place controls for the calculation in the free cell underneath the column index of the column that needs to be calculated. If a calculation is currently selected, a dialog will open where the calculation can be edited. If static text is selected, the static text properties dialog will open. Move columns and cells with controls to the left or right, respectively. Move rows up or down, respectively. Cell contents can also be moved to empty cells via drag & drop. However, in contrast to moving via the arrow buttons, only the contents of the cells will be moved, not the properties of the cells.